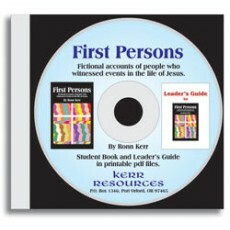 Both the Student Book and the Leader's Guide of the popular study, First Persons, are now available on a single CD Rom from which you can print books as often as you wish. Each story in the Student Book is Biblically-accurate, based on specific Scripture references for study, and filled with detail about life in First Century Palestine. Students not only learn about the particular event in the life of Jesus, they learn how the people of his time lived and played and worked and worshiped. And, they get more deeply involved in study of the Biblical text than with traditional Bible studies. The extensive 100-page Leader's Guide is 8 1/2 x 11" and can be divided up to be distributed to various session leaders without having to make sure the Leader's Guide gets to the right person every week. Individual sections can be saved off the CD Rom and emailed to instructors. The Leader's Guide contains scholarly Biblical background material, leadership suggestions, and creative discussion starters tied to each story.